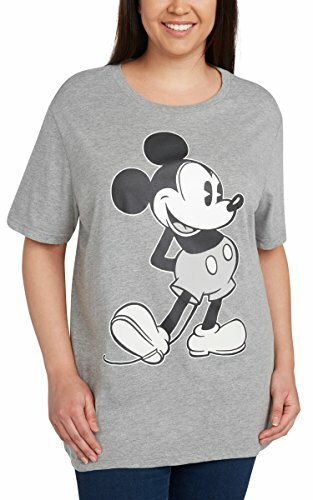 Disney Women's plus size t-shirt with Mickey Mouse print. The soft, lightweight fabric is 60% cotton 40% polyester. Machine wash cold with similar colors, inside out. Tumble dry low and remove promptly. Do not iron decoration. Underarm to underarm (laid flat): 1X=25", 2X=27", 3X=29" & 4X=31"
Length from back of neck: 1X=29", 2X=30", 3X=30" & 4X=31"